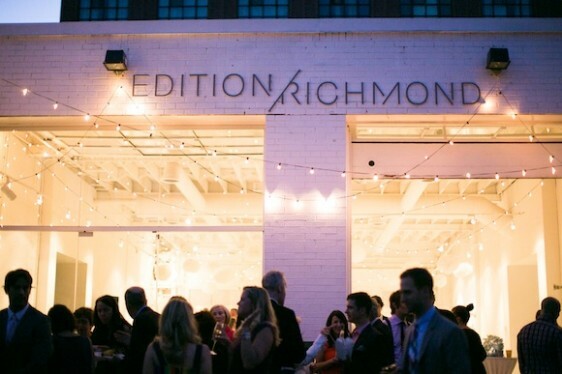 The Edition/Richmond development is now 80% sold. After opening their Sales Centre last spring, the property has been a hot topic throughout the GTA real estate market. Located in Toronto’s trendy Queen West neighbourhood, the development offers a luxury oasis in the heart of Toronto’s most unique, vibrant community. Jump was engaged by the project’s developer, Curated Properties, in the fall of 2011 to partner in the creation of a branding program that translates the stylish space and location into signage, marketing materials and a website. We also created the Neighbourhood Edition Gallery in collaboration with photographer Graham Powell as part of the property’s Sales Centre. The Gallery captures the iconic neighbourhood businesses, people and moments unique to the Queen West lifestyle. The response to the Sales Centre space alone has been incredible. The unique space has become a hotspot for high-profile events, playing host to TIFF Parties, a charity car wash and even a wedding, (the scene at the reception is pictured above). Its days of party hosting, however, are numbered as construction on this highly-anticipated project is set to begin in January. With only four units still available, check out their website for more details on the remaining residences and find out how Jump transformed other clients from blank canvases into buzz-worthy brands on our Branding Design Program page.